Welcome to the SA-SCAN website, the home of scanner monitoring information for South Australia. A scanner is a radio receiver that can automatically tune, or scan, two or more frequencies, stopping when it finds a signal on one of them and then continuing to scan other frequencies when the initial transmission ceases. In this way it is possible to program in multiple frequencies used by a variety of agencies and businesses and monitor their radio transmissions. One minute you could be listening the S.A. Metropolitan Fire Service rushing to save a life and then the next minute you may be listening to an aircraft making its final approach to the Adelaide Airport, such is the diversity of the hobby. Contrary to widespread belief, scanning is perfectly legal. However, you should not use information obtained from listening for commercial gain or criminal activity. Monitoring phone conversations on your scanner is also forbidden. Apart from that, you can pretty well scan as you please, though discretion is advised when using scanners in public. For instance, being an 'ambulance chaser' and turning up at accident scenes, hindering emergency services is an extremely foolish and inappropriate thing to do. Genuine scanner enthusiasts don't want to give politicians an excuse to ban or restrict the hobby, as has occurred in other countries. In South Australia all emergency services and some semi government agencies use the Government Radio Network (GRN), this is a network of over 200 radio sites linked together to form a voice, data and paging network that covers approximately 96% of the population of South Australia and more than 220,000 sq km of landmass. There are approximately 14,000 mobile/portable voice users, 16,000 paging users and 500 mobile data terminals connected to the network. With the use of a 'trunk-tracking' capable scanner you can monitor transmissions on the network from users right around the state (with the exception of the SA Police Department and SA Ambulance Service who use encrypted radios on the network). Programming scanners to correctly monitor the SA-GRN P25 Trunking network can be a difficult and confusing process for people new to the hobby. The Uniden trunk-tracking scanners have a variety of ways that the data is stored within the radio, and programming configurations are often not compatible between different models. The easiest way to program a modern scanner is via a computer and software. The modern Uniden scanners come with a USB programming cable and even include the software that is required on a supplied SD card. The Uniden UBCD436-PT and UBCD536-PT models come programmed with a configuration that will work in Victoria, however it is of little use in South Australia. Fortunately there is an easy solution. Jim from Ozscan has spent a considerable amount of time collating SA-GRN programming information and making it available for a very modest price via an SD card that you can simply plug into your scanner. The time saved by purchasing an already programmed SD card is easily worth the small cost. A variety of scanners are also available to purchase from Ozscan, programmed and ready to monitor the SA-GRN. The SA-GRN has now transitioned to a new P25 system. The previous analog (P16) network has now been switched off and the entire network is now running on the P25 protocol. If you were monitoring the SA-GRN previously, and have not re-programmed your scanner for P25, will no longer hear anything. Monitoring the network with an analog scanner (UBC780xlt / UBC245xlt etc) is no longer possible. Most of the sites are using the same control channel frequencies, however all talkgroups and user ID's have now changed. The SA-GRN page on this site has now been updated to reflect the recent changes to the network. The rollout of the new P25 digital SA-GRN bases has been continuing at a rapid rate over the last couple of months. Nnew P25 control channels have been identified weekly, with many sites now transmitting P25 and existing analog control channel data. Currently the only voice traffic detected on the P25 sites is through the test site in the Adelaide CBD (420.250mhz) although this site appears to be isolated from the rest of the P25 network. Many SA- GRN sites now have P25 frequencies licensed to them in the 420mhz range, with some actually running control channel data now. One of the sites that we have monitored P25 control channel data on is at Kangarilla. It has radios affiliating through it, although it would appear that they are unable to actually transmit P25 voice transmissions yet. If you wish to monitor the P25 control channels, you will need to program your radios with a third base frequency - 420.0125 with a 6.25khz spacing. The network upgrade is now moving ahead fairly quickly, with completion expected by the end of the year, so we anticipate seeing a lot more P25 sites running soon. The group is a great place to share information about radio scanning and monitoring, or ask any questions that you might have. It's a place for new listeners just getting into the hobby, or veterans. Join in now and be part of the discussion about scanning in South Australia. The recent release of the UBCD436-PT portable digital trunking scanner to CFA brigades in victoria has proven to be very popular. The initial limited stocks of the new scanner have been secured very quickly by CFA volunteers with very few remaining available, however Uniden Australia have now released the UBCD536-PT mobile / base trunking scanner to help meet the demand in the Australian market. The Australian version of the 536 radio is programmed with most of the features of the U.S. model, however it is understood that the WIFI connectivity may be missing from the Australian version. If you are interested in a UBCD536-PT contact Jim from the OzScan blog spot. Jim has sold a number of the UBCD536-PT scanners and can assist with programming of the Uniden scanners for most states in Australia. The UBCD536-PT is a highly engineered digital scanner with pre-programmed channels. It scans APCO 25 Phase 1 and Phase 2, Motorola, EDACS and LTR trunked systems, as well as conventional analog. This flexible scanner will suit your everyday needs and maximising your capabilities wherever you go. The UBCD536-PT features "Close Call RF Capture Technology" which automatically "Listens" for any nearby or "close" transmissions and once they occur the scanner immediately tunes in to this frequency. Ideal for use at events or locations when the transmission is unknown, The UBCD536-PT is a state-of-the-art digital scanner radio with Trunk Tracker V and automatic scanning. The Uniden UBCD536-PT TrunkTracker V Desktop Scanner offers state-of-the-art features ensuring it meets the specific and technical requirements of the CFA brigade. The intuitive UBCD536-PT is designed to be future-proof. Uniden Australia have announced that they will release an Australia specific new digital trunking scanner. The Uniden UBCD436HP-ES has been developed in conjunction with the Victorian Country Fire Authority (CFA) who requested a radio to replace their existing 'listening sets' and are expected to be available from November 2015. The UBCD436HP-ES will be an Australian version of the popular BCD436HP Handheld Scanner released in the United States in early 2014. It is also understood that an Australian version of the BCD996XT may be released in the near future. 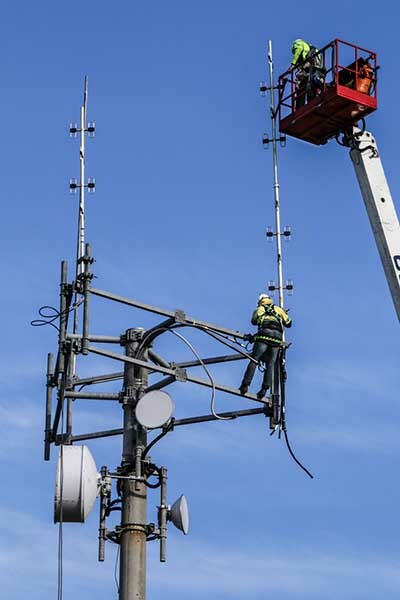 Motorola Solutions was recently selected by the South Australian Government as the preferred supplier to manage and upgrade the SA-GRN for the next seven years. A major upgrade of the network will now take place, with the network moving to the open standard Project 25 protocol. Complex system integration works for the SA-GRN will deliver new infrastructure for voice, dispatch consoles, call logging, network linking and paging. It will be one of the largest of its kind in Australia, supporting more than 20,000 users with more than 200 transmission sites covering 220,000 square kilometres throughout South Australia. As part of the upgrade process all agencies have been re-programming their radios with a new codeplug, featuring analog or P16 digital as well asP25 talkgroup zones. Agencies will remain on their current analog / P16 digital talkgroups until the network is fully P25 compliant and ready for the transition. Replacement of dispatch consoles and voice loggers at the State’s three main Emergency (Triple Zero) Operations Centres (EOCs) by late 2016. 24x7 Network management and support for at least 7 years including built-in upgrades to key equipment and software over that time. A P25 test site has been established in the CBD, this was previously being utilised by agencies to test their radios on the new network. The P25 control channel can still be received however very little voice traffic has recently been heard. The Tour Down Under international cycling event is currently being held throughout the suburbs and hills around Adelaide. The event attracts competitors and visitors from various countries here to see some of the worlds best riders. There is a huge amount of logistics, planning and operational activity involved in holding this event, and a number of radio systems are used to coordinate the activities each day. The radio network used by the race officials following the riders consists of an Icom IDAS Trunking system located in an aircraft that is constantly flying above the riders. The aircraft used this year is either VH-BTR or VH-WHB based out of the Aldinga airstrip, it will fly at approximately 10,000 feet above the event and provide communications via a 1 watt repeater. A second repeater is located in the backup aircraft on the ground, ready to be put to use should the first aircraft need to return for fuel or due to the pilot exceeding their flying hours. Simplex frequencies are used at the start and finish lines, these will be low power and short range and not able to be monitored from a long distance. The trunking system utilises a number of frequencies licensed to Tetracom. Monitoring of the system is possible from http://tdu.no-ip.org a lot of radio activity can be heard once the riders start racing. Traffic on the 'Race Radio' talkgroup is broadcast to all team cars as well as media and other officials, the broadcasts on this talkgroup are given in both English and French. It is possible to listen to this network yourself with the SDR# and DSD Plus software, the radio coverage from the airborne repeater is very good and it should be audible over most of the Adelaide area. The P25 digital site that has been setup to allow agencies to test their P25 equipment has had a change of control channel frequencies. A number of additional voice frequencies have also been added. Depending on which existing GRN talkgroups are patched into the system, the site can be quite busy during the day with voice traffic. An updated talkgroup list is now available here. The SA Ambulance Service will change to digitally encrypted talkgroups on the evening of the 11/11/14. The change will mean that there will be no way for SA Ambulance transmissions to be monitored on a scanner. This will also affect all other Health Department agencies, including the Rescue Helicopter service and all hospitals. A P25 digital site has been established on the State Administration Centre building near Victoria Square in Adelaide. This site has been setup to allow agencies to test the digital capabilites of their SA-GRN terminal equipment, and has coverage across the city and surrounding suburbs. Many agencies have patched their existing analog talkgroups into the new digital talkgroups to allow testing through this site. To monitor this system on a Uniden digital trunking scanner, just setup a new P25 'Standard Trunk' system, and create a new site in that system with the frequency 413.275mhz. No other frequencies or base and offset data is required to monitor this system. The Metropolitan Fire Service metropolitan operations talkgroup 150 has recently been heard on the P25 site using on ID 694. The Dept. of Environment have been heard on talkgroup ID 3169. Please advise us via SA-Scan@yahoogroups.com if you identify any further new talkgroups. The feed is running off a RTL28232U dongle connected to the SDR# software, which is feeding the DSD+ program to do the digital audio decoding. The audio you hear may sound slightly muffled, this is a product of the digital decoding and is probably as good as it is going to get at the moment. Uniden in the United States recently released details on two new trunk tracking scanners which are expected to be available in January 2014. The two new scanners are the BCD536HP base / desktop unit and the BCD436HP portable unit. Both of these radios will work on the following modes - TrunkTracker V with support for APCO Project 25 Phase I and Phase II, X2-TDMA, Motorola, EDACS, and LTR Trunked Radio System. Uniden have hinted that software and firmware upgrades will be possible with these radios, with a possible inclusion of further modes in the future. We can only hope that DMR is one of the modes they are looking at. Regardless of the lack of DMR compatibility, these new scanners are still a very nice radio, with plenty of features to keep people interested. The ability to record transmissions directly to an SD card in the radio is very handy, as is the ability to stream your radio through a WIFI connection via an app to anywhere in the world. It is unknown whether Uniden in Australia have any plans to release an Australian model of these scanners, however the US models will work on our SA-GRN system. In another interesting development, Whistler Electronics - who recently purchased GRE Electronics have announced that they will also be releasing a number of new scanners in 2014, suggesting that they will be actively looking at ways to monitor some of the new technology modes. Either way it is good news for scanner users, who have been left with little choice of late when it comes to digital trunking scanners.